I have not met with this species in the State of Louisiana more than half a dozen times; nor indeed have I seen it at all in the Western States, excepting that of Ohio, where I have occasionally observed an individual, apparently out of its usual range. Some of these individuals were probably bound for the Upper Lakes. The woody sides of the sea are the places to which this species usually resorts. It passes from the south early in March, and continues its route through Florida, Georgia, and all the other States verging on the Atlantic, beginning to rest and to breed in North Carolina, and extending its travels to the Province of Maine. The flight of this species is swifter than that of its near relative, the Yellow-billed Cuckoo, for which bird it is easily mistaken by ordinary observers. It does not so much frequent the interior of woods, but appears along their margins, on the edges of creeks and damp places. But the most remarkable distinction between this species and the Yellow-billed Cuckoo, is, that the former, instead of feeding principally on insects and fruits, procures fresh-water shellfish and aquatic larvae for its sustenance. It is, therefore, more frequently seen on the ground, near the edges of the water, or descending along the drooping branches of trees to their extremities, to seize the insects in the water beneath them. The nest of this bird is built in places similar to those chosen by the other species, and is formed of the same materials, arranged with quite as little art. The females lay from four to six eggs, of a greenish-blue, nearly equal at both ends, but rather smaller than those of the Yellow-billed Cuckoo. It retires southward fully a fortnight before the latter. The observations respecting the curious manners of our Yellow-billed Cuckoo, the subject of the last article, might be repeated here, for the present species is similar in this respect, as has been ascertained by Dr. T. M. BREWER of Boston. Its eggs are not only smaller than those of the other species, but also rounder, and of a much deeper tint of green; they measure one inch and half an eighth in length, and seven-eighths in breadth. The Black-billed Cuckoo is rare in all the Southern States, my friend Dr. BACHMAN never having seen it in the maritime districts of South Carolina, nor myself in any part of Georgia, although WILSON, who first distinguished this Species, says that Mr. ABBOT of Georgia found it there, and was well aware of its being distinct from the yellow-billed species. I met with it in Texas, arriving from the south; and found some individuals in winter, in the central parts of the southern districts of Florida. On the other hand, it is not uncommon in Nova Scotia and Newfoundland, and we saw a few in Labrador, amid the clumps of low trees a few miles from the shore of the Gulf in secluded and pleasant valleys. It does not appear that it reaches the Fur Countries, or the Rocky Mountains, as no mention is made of it by Dr. RICHARDSON or Mr. TOWNSEND. 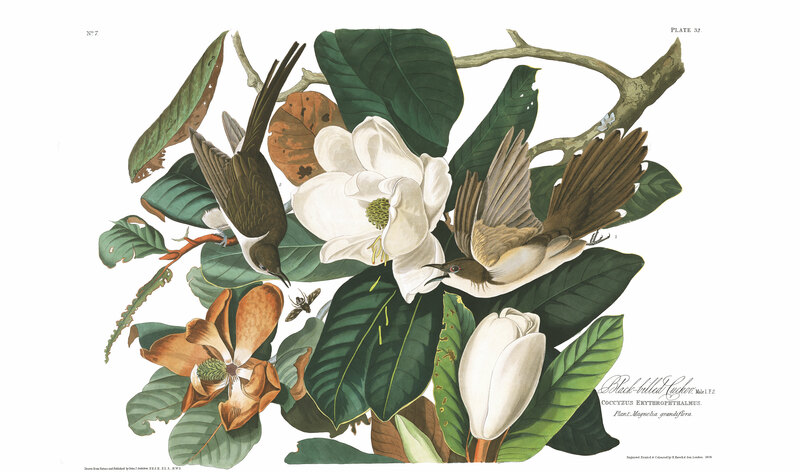 It being so scarce a species in Louisiana, I have honoured it by placing a pair on a branch of magnolia in bloom, although the birds represented were not shot on one of these trees, but in a swamp near some, where the birds were in pursuit of such flies as you see figured, probably to amuse themselves. BLACK-BILLED CUCKOO, Cuculus erythrophthalmus, Wils. Amer. Orn., vol. iv.p. 15. COCCYZUS ERYTHROPHTHALMUS, Bonap. Syn., p. 42. ST. DOMINGO CUCKOO, Coccyzus dominicus, Nutt. Man., vol. i. p. 556. BLACK-BILLED CUCKOO, Coccyzus erythrophthalmus, Aud. Orn. Biog., vol. i.p. 170; vol. v. p. 523. From Texas to Nova Scotia, and in the interior to Kentucky. Rather common. Migratory. Bill as long as the head, compressed, slightly arched, acute, not more robust than that of many Sylviae; upper mandible carinated above, its margins acute and entire; lower mandible carinated beneath, acute. Nostrils basal, lateral, linear-elliptical, half-closed by a membrane. Head and neck of ordinary size. Body rather slender. Feet short and small; tarsus scutellate before and behind; toes two before, separated; two behind, one of which is versatile; the sole flat; claws slender, compressed, arched. Plumage blended, soft, slightly glossed. Wings long, the first quill short, the third longest. Tail long, graduated, of ten feathers, which are rather narrow and rounded. Upper mandible brownish-black; lower bluish. Iris hazel. A bare space of a deep scarlet tint around the eye. Feet dull blue. The general colour of the upper parts is light greenish-brown. Cheeks and forehead tinged with greyish-blue. Tail-feathers, excepting the two middle ones, tipped with white. Under parts brownish-white. Length 11 1/2 inches, extent of wings 15; beak along the ridge 5/6, along the gap 1 1/4. The female differs very little in external appearance from the male, and is nearly of the same dimensions. A male preserved in spirits measures to end of tail 12 inches, to end of wings 8 1/2, to end of claws 8; extent of wings 15 1/2; wing from flexure 5 1/2; tail 5 1/4. The interior of the mouth presents the same appearances as that of the other species, its width 7 twelfths; the tongue 8 twelfths long, of the same form, but black, as is the whole of the mouth. The oesophagus is 6 twelfths in width at the commencement, and gradually contracts to 3 twelfths; but the proventriculus is 6 twelfths in breadth; its glands smaller than in the other species, and forming a belt 1/2 inch in breadth. The stomach is similar to that of the Yellow-billed Cuckoo; its tendons about 4 twelfths in length, and 3 twelfths in breadth; the inner surface soft, with faint longitudinal rugae, although quite smooth. Pylorus small, with a semilunar margin. The lobes of the liver are very unequal, the left 5 twelfths, the right 10 twelfths in length. The contents of the stomach are remains of insects, with a few short hairs scattered here and there over its internal surface. The intestine is 11 1/4 inches long, very slender, its width from 2 1/2 twelfths to 1 1/2 twelfths; the cloaca oblong, 5 twelfths in width; the coeca, fig. 2. p. 522, 1 inch 1 twelfth long, their greatest width about the middle 2 1/2 twelfths, narrowed toward the extremity. The trachea is 2 inches 2 twelfths long, moderately flattened, from 1 1/2 twelfths to 1 twelfth in breadth; its rings 58, with 5 additional dimidiate rings. Bronchi of about 10 half rings. The muscles as in the other species. MAGNOLIA GRANDIFLORA, Willd., Sp. Pl., vol. ii. P. 1255.